Every holiday season, my generous and talented neighbor Cornelia brings over one of the Christmas treats I love the best: A cellophane bag of cookies she's made, using recipes from her native Switzerland. Some of them are best to eat right away, but some — like this one — are to be savored at the right moment, dunked in hot chocolate or in hot, milky coffee. This recipe suggests the traditional way of making the cookies: by shaping a crescent and then slashing the outside edge three or four times. The result is a pretty, leafy-looking cookie. 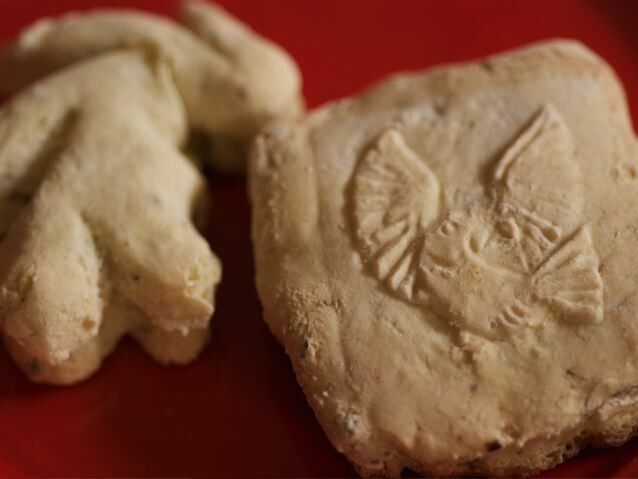 Sometimes, though, Cornelia shapes the cookies into a block and presses them with a wooden stamp that was given to her by her mother (see photo). p(blue). With our Sweet 16 blog, we present a holiday dessert recipe every weekday for the first few weeks of December. Congratulations to Diane, who was our daily book winner for December 18.\ Check out our latest Sweet 16 blog recipe for another chance to win. h6. \A daily was selected at noon (PST) on Thursday, December 18, 2008, from all valid entrants. All eligible winners must have U.S. mailing addresses. Please note that all standard Culinate contest rules apply to this drawing.